Crime and violence stain the pages of modern history, and sadly violence and crime is most certainly part of our future. People are really fascinated with the criminal mind, so today you have many TV-shows and movies that glamorize true crime. Selecting only five most notorious criminal is more than a daunting task, but we were up to the challenge. We have assembled a list comprising of the most notorious criminals in the modern history, a list of violent villains and above all a list of dangerous people from mob bosses to drug lords who haunted the world for many years after their death. The first place on our list definitely goes to a Columbian drug lord, Pablo Escobar. He controlled numerous drug empires while murdering thousands of people from all over the world in order to save his drug empire. 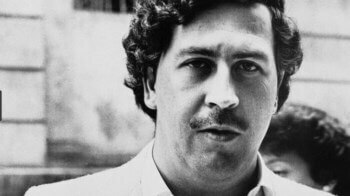 Pablo led one of the most feared and most powerful criminal organizations which have been assembled in the modern history. He had power over numerous drug empires, airlines, mansions and gansa composed of other notorious criminals and soldiers. Pablo also hired several hitmen in order to kill police officers who were paid in order to bring him to justice. During Pablo’s time crime rate in his homeland, Columbia dramatically rose. He was killed back on 2nd of December in 1993 at the age of forty-five. Griselda Blanco is best known as The Cocaine Grandmother. She was a pioneer when it comes to the biggest cocaine drug trade in Miami. Griselda spent her childhood pickpocketing. Later when she grew up she was arrested on a federal drug charge and was sentenced to 10 years in prison. However, inside the Miami prison, Griselda continued her cocaine business with the help of her secret underlings. The Black Widow or the Cocaine Grandmother was just behind Pablo Escobar when it comes to the narco-trafficking. She ruled the underworld back in the 1970s and 1980s. It is estimated that Giselda is responsible for more than two hundred murdered while running her cocaine business and transporting drugs from Columbia to Miami, South Carolina, and New York. She was shot to death on 3rd of September in 2012. She was sixty-nine years old. Jesse James was a gang leader who was involved in several trains and bank robberies as well as murders. Jesse James was one of the most famous members of the most notorious 19th-century gang known globally known as the James-Younger gang. Jesse also used to be a Confederate guerilla in the Civil war and later was normally linked as modern Robin Hood. There is common belief that Jesse was involved in the several atrocities committed against several Union soldiers in the Civil War. Jesse James definitely is one of the most famous American outlaws. He together with his brother joined guerillas operating in Kansas and Missouri. He died at the age of thirty-four on 3rd April in 1882. His death became a huge national sensation. Alphonse Gabriel Capone is best known by his nickname Scarface. He was American crime boss, mobster, and businessman who rose to prominence during the Prohibition era. He was the boss and co-founder of the Chicago Outfit. His criminal career spanned seven years and it ended when he was thirty-three years old. Al Capon was a member of a notorious Brooklyn-based gang known as Five Points, Gang. AL Capone dedicated his life to prostitution and smuggling liquor at a very young age while being the member of the gang. Al Capone also held a Prohibition-era syndicate which led him to be behind bars on tax evasion charges. After he was released from prison, he was treated for paresis. He died of a stroke on 25th of January in 1947. One of the best movies ever made Scarface is inspired by the life of Al Capone, it’s definitely one you need to check out. Billy the Kid was infamous American old West gunfighter who occasionally participated in Lincoln Country War killing more than thirty people. He was born as Henry McCarty but was best known by his nickname Billy the Kid. He was arrested for the first time due to stealing food back in 1875. He was arrested for the second time for stealing firearm and clothing just five months after being arrested for the first time. He was able to escape the jail two days. Soon he was a federal fugitive and an outlaw. He was a gangster who murdered his first victim at the age of eighteen. There are some sources stating that Billy the Kid only killed those people who deserved to bill killed like criminals. He died very young at the age of twenty.one on 14th of July in 1881. He was shot by Sheriff Pat Garrett.